The Russell terriers are descended from a line of terriers bred by the Rev. John Russell in the mid- to late 1800s in England. The dogs were strictly bred as working dogs to hunt fox. Today, there are four types of Russell terriers recognized by different organizations. The Jack Russell terrier is a recognized breed with the Jack Russell Terrier Club of America, but is not recognized by the American Kennel Club. Because the focus was on breeding a working dog, Jack Russell's appear in a variety of sizes and types. The breed standard for the Jack Russell is that they have a square and balanced body and are 10 to 15 inches tall. Jack Russell's are known for being fearless and happy. They are mostly white, with brown, tan or black markings. Three coat types are acceptable for the breed. A smooth coat provides protection from the elements but does not display any trace hair. Rough coats may have trace hair on the legs, head, face or body. A broken coat terrier has trace hair covering the head and body. The English Jack Russell terrier is not recognized by American Kennel Club, but the breed can be registered through the English Jack Russell Terrier Club Alliance. The breed is bold, fearless and friendly. According to the breed standard, these dogs measure 8 and 12 inches in heights and have a body that is longer than it is tall. 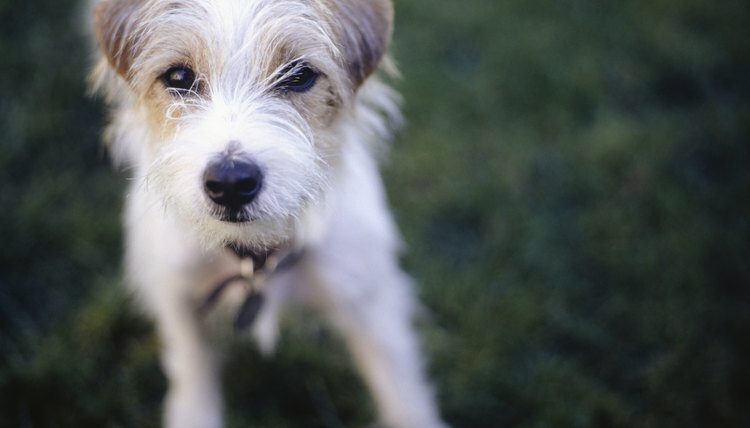 Like the Jack Russell, these dogs may have smooth, broken or rough coats. The Russell terrier was developed in Australia, although the breed originated in England. The Russell terrier is 10 to 12 inches tall with a longer body, resulting in a rectangular shape. Smooth, broken and rough coats are all acceptable. These terriers are alert, spirited and intelligent. Russell terriers can be registered with the American Russell Terrier Club and are recognized by the American Kennel Club as of 2004. The Parson Russell terrier was accepted into the American Kennel Club in 1997 and can be registered with the Parson Russell Terrier Association of America. They originated in England. The terrier should be between 12 and 15 inches tall and have a square, balanced body shape. Smooth and broken coats are accepted by breed standards. These dogs are bold, clever and athletic.